The ninth edition of Letras en la Mar · International Meeting of Poets and Art, will pay tribute to the Mexican writer Alberto Ruy-Sánchez Lacy, Premio Nacional de Ciencias y Artes en Lingüística y Literatura (National Prize of Sciences and Arts in Linguistics and Literature) (2017) and Premio Xavier Villaurrutia (Xavier Villaurrutia Prize) (1987), whose work has been translated into a dozen languages. Ruy-Sánchez Lacy will be in charge of the opening poetry gala on April 3rd, 2019 at 8:00pm in the open-air auditorium Aquiles Serdán of Los Arcos del Malecón. Ruy-Sánchez has published about twenty titles, including the essays Elogio del insomnio, Con la literatura en el cuerpo, Una introducción a Octavio Paz and Quinteto de Mogador, among others. The tribute to the poetic work will be for the Mexican writer and poet Dante Medina, in a meeting with the students of Universidad de Guadalajara. In addition, on the occasion of the International Year of Mother Languages, Mayan poet Sol Ceh Moo will participate in a dialogue and recital of her own work. During the festival there will be four recitals with the poets Jean Portante, from Luxembourg; Graham Buchan, from England; Antonio Rivero Taravillo, Rafaela Hamen and Balbina Prior, from Spain; Diti Ronen, from Israel; Sarah Clancy, from Ireland; Bernard Pozier, from Canada; as well as Dante Medina, Ángel Ortuño, Gustavo Iñiguez, Sayuri Sánchez y Melisa Niño, from Mexico. The meeting of humanists integrates a variety of public and free activities around literature, such as literary gatherings and recitals, tributes, book presentations, poetry reading, workshops and talks among prominent writers with children and young people of our destination. Promoted by the Universidad de Guadalajara and the Hugo Gutiérrez Vega Chair through the Centro Universitario de la Costa and the Instituto Vallartense de Cultura, the meeting had its first edition in the spring of 2011 and was inaugurated by writers Juan Gelman, Fernando del Paso and Marco Antonio Campos. 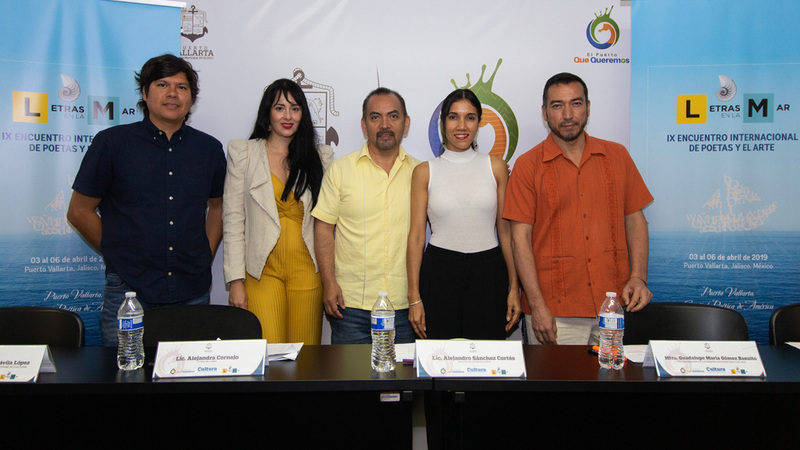 The presentation of the event was attended by Arturo Dávila, deputy director of the Instituto Vallartense de Cultura; Alejandra Cornejo, responsible of communications of Letras en la Mar; Alejandro Sánchez, director of Letras en la Mar; Lupita Gómez Basulto, extension coordinator of CUCosta and Viktor Boga, operations director of Letras en la Mar.